Be the first to share your favorite memory, photo or story of Antoinette "Toni". This memorial page is dedicated for family, friends and future generations to celebrate the life of their loved one. The service of the celebration of the life of Antoinette “Toni” Bartz will be held on Saturday, March 30, 2018 at St. Symphorosa Church, 6135 South Austin, Ave., Chicago, IL. at 10:30 A.M. Interment St. Casimir Lithuanian Cemetery. Toni passed peacefully at the Oklahoma Methodist Manor on the 22nd day of March, 2018 surrounded by her loving family. Toni is survived by her son Bob Bartz and his wife, Cindy Bartz and her daughter-in-law, Kimbra Bartz who was married to Steve Bartz who passed on March 15, 2016. 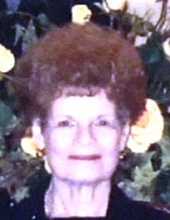 She is predeceased by her husband, Robert Bartz (5/28/98), her brother John Meskinis (6/7/2002), her mother, Antonia Meskinis (6/1/2006) and her father, Mike Meskinis (3/21/62). Toni had four grandchildren, Bridgette Edwards married to Ben Edwards (San Antonio, TX. ); Brittany Dancer married to David Dancer (Dallas, TX. ); Brittany Selman married to Wes Selman (Dallas, Tx.) and Courtney Bartz married to Josiah Hulsey (Katy, TX.) . Toni loved her six great-grandchildren: Brayden, Brooklyn, Brynlee and Bailey Edwards and Dirk and Dak Dancer. Toni was born on February 14, 1933 in Chicago, Il. to Mike and Antonia Meskinis. She worked at Holy Cross Hospital, The Draugas (Lithuanian Newspaper) and Central Steel & Wire. She will be remembered for being a care giver to her husband, brother and mother and for loving her husband, her sons, her daughter–in-laws, her granddaughters and great-grandchildren. Gimė 1933 m. vasario 14 d., Chicago, IL. Mirė 2019 m. kovo 22 d. Tulsa, OK.
Gyveno Tulsa, OK. anksčiau Chicago Garfield Ridge ir Marquette Park apilikejiai. Nuiludi liko sūnus Bob Bartz su žmona Cindy; marti Kimbra Bartz; anukai Bridgette Edwards su vyru Ben, Brittany Dancer su vyru David, Brittany Selman su vyru Wes, ir Courtney Bartz su vyru Josiah Hulsey; proanukai Brayden, Brooklyn, Brynlee, ir Bailey Edwards ir Dirk ir Dak Dancer. A, + A. Antonia buvo žmona A. + A. Robert Bartz, motina Steve Bartz, sesuo Jonas, ir duktė Antonia ir Morkas Meskinai. Antonia anksčiau dirbo Šv. Kryžiaus ligoninė, Draugas, ir Central Steel & Wire Co.
Šv. Mišios bus šeštadieni kovo 30 d. 10:30 val. ryto Šv. Symphorosa Bažnycioje, 6135 S. Austin Ave., Chicago, IL. 60638.. Po Šv. Mišiu velionė laidotuves bus Šv. Kazimiero Lietuvių kapinese. To send flowers or a remembrance gift to the family of Antoinette "Toni" Meskinis Bartz, please visit our Tribute Store. "Email Address" would like to share the life celebration of Antoinette "Toni" Meskinis Bartz. Click on the "link" to go to share a favorite memory or leave a condolence message for the family.